In larger-than-life New York City, 4th of July fireworks festivities are no exception. 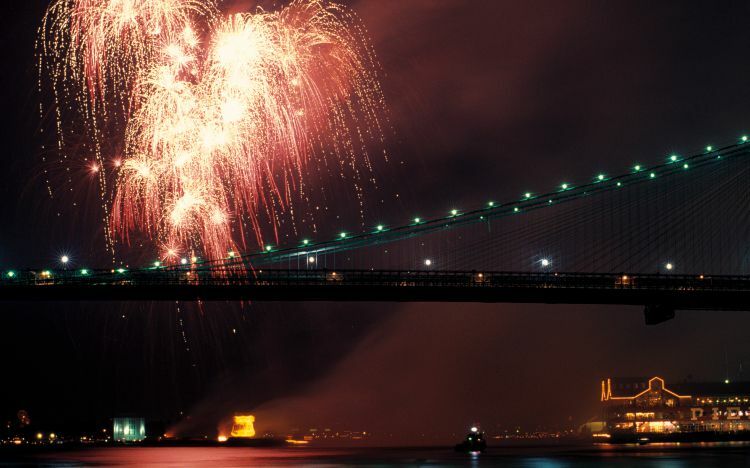 With dazzling display being shot off from several barges positioned along the East River, you can catch the nation's largest Independence Day pyrotechnics show (courtesy of Macy's) from these four primo perches across Manhattan. Just be sure to plan your viewing strategy now, as some spots require reservations, and tickets are going fast. With the fireworks going off from the East River, you can be sure that the river and nearby New York Harbor will offer some of the best (floating) seats in the house. A lot of 4th-of-July evening cruises have already booked up, and others are extremely pricey, but at press time, there was at least one good option to be found. New York Water Taxi has spots left on their 3.5-hour-sailings (leaving from Pier 45), with ticket prices that include hors d'oeuvres, a light buffet, desserts, and soft drinks; a cash bar is also available for beer and wine.